According to the 2019 Pizza Power Report nutritionist Chelsey Amer told The Daily Meal in January that pizza isn’t necessarily an unhealthy way to kick off your morning. “You may be surprised to find out that an average slice of pizza and a bowl of cereal with whole milk contain nearly the same amount of calories. Plus a slice of pizza contains more fat and much less sugar than most cold cereals, so you will not experience a quick sugar crash.”, Amer said. So while I wouldn’t necessarily recommend your classic meat lovers pizza for breakfast nor that you eat it every day, there are plenty of ways to create a healthy breakfast pizza from the bottom up starting with crust options - whole grain, whole wheat, or even cauliflower - and finishing them off with healthy toppings and eggs like our Zest Breakfast Pizza. Drizzle crust with olive oil, then sprinkle with desired quantities of minced garlic, salt and pepper. Spoon desired quantity of tomato sauce or mainara (if using) over the entire pizza. Slather the crust with some ricotta (or place in random knobs if desired). Scatter spinach or arugula and ham atop the ricotta. Top with a generous amount of freshly grated parmesan cheese. Place pizza in oven for 3-5 minutes. 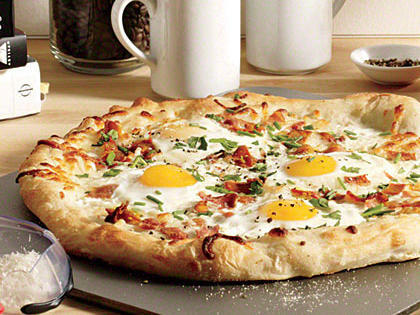 Remove pizza from oven and crack 3-4 eggs (depending on size) onto the pizza. Place back into the oven for an additional 5-7 minutes or until yolks are just set and golden.